The Steelers head to Mile High as a veritable MASH unit -- the offense is without it's most explosive running back (and I know I've been critical of Rashard Mendenhall from time to time, but he looked really good to me the last few weeks), the line is missing monster center Maurkice Pouncey and Pig Ben is limping around on an ankle that's about as sturdy as under-cooked bacon. (Mmmm ... bacon.) On the other side of the ball, who knows how well or how long LaMarr Woodley will play on that gimpy hamstring. And of course, Ryan Clark (the team leader in tackles with an even 100) cannot play or he might actually, you know, die. I'd feel a lot better if at least some of those guys were healthy. 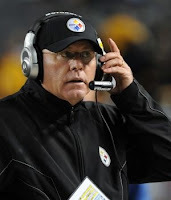 Bruce Arians has a Super Bowl ring. He has made another trip to the Super Bowl. I have tried and tried to like the guy. I tell myself -- and it's true -- that he knows way more about football than I do. And yet, I don't trust the guy calling a big game. 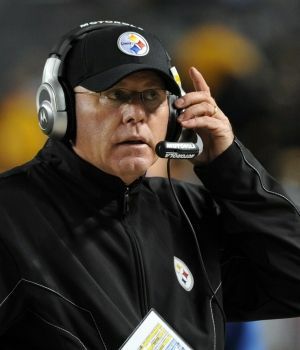 At the end of the day, who else is to blame for the Steelers woeful scoring this season? This was the year the Steelers offense was going to explode, with a line anchored by Pouncey, a stable of wide outs that would make most NFL QB's drool, an RB with a pedigree, and an under-rated but wildly reliable TE. Plus, Pig Ben for all 16 games (no nettlesome sexual assault accusations or suspension) this time. And while I didn't expect the Steelers to rival the Saints in terms of points scored, I do think that a better OC would have turned that much talent into more points. Yup. I said it. Arians is just not in the caliber of the best OC's out there. I think this is an important point to make -- any time I (or any other fan or writer) lob criticism at Arians, that doesn't mean that I think he is incompetent. I don't mean that at all. What I do mean to say is that Bruce Arians is not among the Top 10 OC's in the game; perhaps he is in the bottom half, even. (Near the top of the bottom, but in the bottom nonetheless.) With Pig Ben, third-down Antonio Brown, Mike Wallace, et al., they should have averaged more than their pitiful 20.3 points per game. [The only playoff team with a worse scoring average -- you got it -- your Denver Broncos at 19.3 ppg.] Even worse, the Steelers averaged just 15.6 points per game on the road. Personally, I think they need to put at least 24 up on the board to win without giving the entire 4-1-2 area code a coronary. Beyond which, if the Steelers are up to their usual tricks of getting field goals rather than touchdowns, that feeds right into the Broncos game plan to keep it close and hope for the best in the waning moments of the game. 3. Elvis and Von. (That would make a great cop show, wouldn't it? Elvis and Von. Tuesday nights on NBC). At any rate, the Broncos defense has looked a little worn out to me the last couple of weeks, but don't overlook Von Miller (beast) and Elvis Dumervil. They are such speedy pass-rushers that they can be back on Pig Ben in a flash. When he is 100% healthy (is Pig Ben ever 100%? ), and if he has a split second of awareness that the rush is coming, he can often shake off speed rushers. But currently he makes Quasimodo look fast and graceful and I worry that Miller and Dumervil will get into his grill all day long. And we know this -- when hit with a quick, unexpected rush, Pig Ben sometimes coughs up the ball. The Broncos needs breaks, they need for flukey things to happen to win this game. A couple of QB fumbles would fit that bill, would it not? 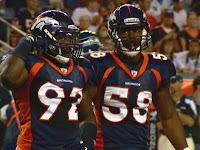 What's the one thing the Denver Broncos offense does really well? Run. What's not quite up to the usual standards? The Steelers run defense. Face it, the Steelers under LeBeau have been like the Navy Seals of defenses against the run. But not this year. Ranking eighth in rushing defense for the Steelers is akin to finishing dead last. Anything outside of the top three in the NFL is a shock. Even more telling -- all four Steelers losses have come against good rushing teams -- the Houston Texans, the Ravens (2x's) and the San Francisco 49ers. In fact, the Steelers, who hadn't given up 100 yards to a single running back since Ken Starr was chasing around after a stained, blue dress, gave up 107 to Ray Rice in the season opener. (I keed. It was more recent than that, but not much.) Then they gave up 155 to Arian Foster. And the 49ers controlled the game with a sustained ground attack, if not a big game for a single player. I'm just saying -- the Broncos run well and the Steelers aren't what they once were against the run. Everybody wants to point to the year the Steelers won the Super Bowl as the six seed in the AFC, winning three road games to get to Detroit. These Steelers? Ain't those Steelers. The 2011/2011 version are 5-3 on the road this year. Let us, for the moment, ignore those three (at Baltimore, San Fran and Houston) losses and, instead, take a look at some of the wins the Steelers have amassed on the road this year. First, their 23-20 win against the feckless Indianapolis Colts, which was about as much fun to watch as the entire Ingmar Bergman collection. The Colts have been a season long embarrassment and yet it took a Troy Polamalu fumble return and a late drive by the offense to beat the worst team in the NFL. As stinky and unsatisfying as that was, somehow, the win over the Kansas City Chiefs felt even worse. The Chiefs were lead by none other than Tyler Palko. Eegads. And yet it was another nail-biter, another game in which I had to admit: this team is bad stinky on the road. This year more than most years, the Steelers really do play to the level of their competition and this is particularly apparent on the road. I'm not a betting person (I'd rather light a cigarette with a 50 dollar bill than gamble), but if I were a betting person, I'd take the Broncos and the (eight) points. I suspect it will be a close game. A close, low scoring game. Just typing that actually made the bottom drop out of my stomach. Still, my prediction is -- Steelers 17, Broncos 13 and about 48 minor cardiac incidents in Western Pa.